Blues legend has it that Robert Johnson met the Devil at a crossroads, and that's where he got his guitar talent. 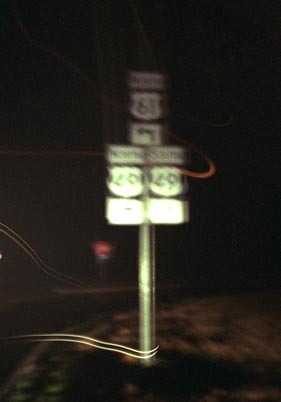 A leading contender for the crossroads where this took place is the intersection of Highways 61 and 49, the two main highways through the Delta. Problem is, the meeting never happened: It actually was Tommy Johnson (no relation), who claimed he "had gone down to the crossroads to meet Legba, a devious African god, who returned his guitar and taught him how to play afresh." (Fodor's Rock & Roll Traveler USA, p. 116). The roads have moved, and they don't meet where they did then. But we were in Clarksdale, in the middle of a furious thunderstorm, and the lights had just gone out in the pool room where Alex was cleaning Ken and Doug off the table, and it was 11:30 p.m. The temptation was too easy--we drove up to the crossroads. If you want to make a contract with the devil . . . Take a black cat bone and a guitar and go to a lonely fork in the roads at midnight. Sit down there and play your best piece, thinking of and wishing for the devil all the while. By and by you will hear music, dim at first but growing louder and louder as the music approaches nearer . . . After a time you feel something tugging at your instrument . . . Let the devil take it and keep thumping along with your fingers as if you still had a guitar in your hands. Then the devil will hand you his instrument to play and will accompany you on yours. After doing this for a time he will seize your fingers and trim the nails until they bleed, finally taking his guitar back and returning your own. Keep on playing; do not look around. His music will become fainter and fainter as he moves away . . . You will be able to play any piece you desire on the guitar and you can do anything you want to in the world, but you have sold your eternal soul to the devil and are his in the world to come. The movie Crossroads made much of this myth, including a jam session where Bach's music finally beats the Devil's rock-'n'-roll. Although there's nothing to the myth, the haunting music Robert Johnson left behind fits it well, with songs like "Hellhounds on My Trail," "Me and the Devil Blues" and "Crossroads Blues," which Eric Clapton made famous when he was in Cream. Robert Johnson was born in 1911 in Hazelhurst, MS, which we drove through very late at night on our way to New Orleans (we didn't stop). Since he died in 1938, a lot has been written about him; a lot of what he played has filtered into modern music, in both homages and indirect influences (along with Eric Clapton, little bands like Led Zeppelin and the Rolling Stones, among others, both acknowledged their debt to him, including many of his songs in their repertoire). For more about him, you could start with the boxed set "Robert Johnson: The Complete Recordings," issued by Columbia in 1990, with a booklet that includes all kinds of biographical detail, full lyrics, a copy of the death certificate, and musings by Eric Clapton and Keith Richards. We had intended to have made it further through the Delta by now, but we had left Memphis late enough the day before that by the time we reached Clarksdale the sun had gone down. We had wanted to go see the site on the old Stovall Plantation where Muddy Waters' shack had once resided (until the House of Blues chain put it on tour to raise fund for the Delta Blues Museum), and Alex had detoured us through Friar's Point with that in mind, but it was so dark by the time we came into town that it would have been silly to stop. But we didn't want to miss the Delta Blues Museum and various other stops along the road that started here in Clarksdale and wound south, so we found a hotel (there were several good ones to choose from) and settled in for the night. We all agreed it would be a good opportunity to catch up on our rest. First, though, we did want to slip out for a little dinner. After a brief rest and a chance to shower up (and for Doug and Alex to use the hotel's indoor pool), using a variety of maps we made it over to central Clarksdale, where we found not one but two drive-in diners side by side. What fun! We left the music on high (Black Crowes' Southern Harmony and Musical Companion) and dug in to catfish and fries. It was lucky there was another diner next door, because the one we had chosen was out of onion rings. Alex went on over to get some while Ken and Doug watched the diner's employees close the place down. Clarksdale is not a late-night community. After eating, we had a little energy left, so after driving up and down a bit (Clarksdale's not a vast town, but at night it took a little fumbling to get bearings), we found just about the only place left open anywhere, a small bar near a hotel, with a pool table and a jukebox. That was enough to keep us entertained for a while, so Alex and Ken went over to get the jukebox going while Doug arranged for some beer. They were about to close, but didn't mind staying open as long as we were there. The woman behind the bar was chatting with a friend of hers. Things were very relaxed. After Alex embarrassed Ken and Doug on the pool table, we found a need for more quarters, and after she did it a second time, we had to return for change again. The women at the bar were cheering for the woman who kept wiping out these guys. Meanwhile, outside it was getting thick and stormy. Lightning bolts kept sizzling down out of the sky to explode in thunder nearby. The storm blew closer and closer. Wham! A bolt smashed down outside, and the parking lot lights were out. Wham again! The lights went out inside, and the juke box went dead. We stuck around while one of the women went into a back room to find a flashlight or at least some candles, and we watched the rain sheet down outside. One of the women called her boyfriend, who said he'd come pick them up. Doug hustled across the street in the rain to retrieve the car, driving it right up to the bar door so Alex and Ken wouldn't have to get drenched when they got in. That was when we got inspired to go find the crossroads. After the crossroads, since everybody's energy still seemed good (technically it was only quarter to midnight when we were there, but there wasn't a lot to do but sit and stare at trucks roaring by, so we left), we decided to head up the road to try us some gambling. None of us were big gamblers, but it was one more chance to have a look at the Mississippi and the culture along it. Modern gambling on the Mississippi is very different from the riverboat gambling you see in films like Maverick. Some consider it a scourge, though it certainly is bringing money in to this impoverished area. It's modernized, industrialized, all electronic bells and whistles and flashing lights, 24-hour-a-day neon with no culture attached. Frederick Barthelme's novel Bob the Gambler tells about Mississippi's Gulf Coast casinos, but the ones on the river aren't much different. Casinos these days all have the same cheesy feel, whether you're in Biloxi or Atlantic City or Vegas. Or on the river. That having been said, we did good at the nickel slots. Alex was thrilled to walk out about $15 heavier than she'd walked in. So by the time we got back to Clarksdale and found our hotel again (it had stopped raining), we got to bed good and early, and we were up at the crack of dawn to see the Delta Blues Museum. Actually, Ken got a free room that night, because the hotel didn't give him his wake-up call. 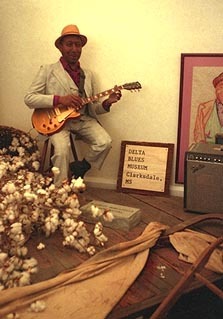 The Muddy Waters display at the Delta Blues Museum, complete with cotton and a headstone. 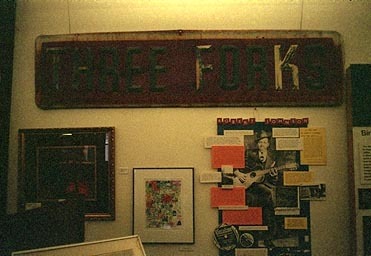 The Delta Blues Museum was a neat place to stop. It's mostly one large second-floor room filled with memorabilia, artifacts, informative displays. We all learned different things here. It didn't take long to check the whole place out. The museum gets about 1,000 visitors a month, from all over the world. If you do the math, that works out to a little over 30 visitors over the course of a day--probably many more during the summer blues festival, not so many on an average weekday. So it was not too crowded. There might have been one or two other people there with us. If the Blues Museum, a relatively major attraction in a biggish town (pop. 20,000 or so) at the intersection of two highways, with a lot of publicity and some minor funding, gets so few visitors, you can imagine how those numbers scaled down for many of the other places we wanted to see in the Delta, which were unmarked spots in tiny backwater hamlets miles from the beaten path. We never felt like we were surrounded by too many fellow travelers. It's curious to see how little attention this area gets, even with the likes of Jimmy Page and Robert Plant naming an album Walking Into Clarksdale. Compare it to Colonial Williamsburg, which is a huge tourist attraction, very well developed, with hordes of visitors: When you push the scan button on your radio, do you pick up more stations influenced by the blues, or more with that classic "Williamsburg 1700s" sound? Not that Williamsburg didn't have its own influence on our culture, in other ways, but for an area with a relatively recent, and dramatic, contribution to American culture, the Delta feels almost completely ignored. And that was one of the great things about it. No Kodak vendors, no hot dog stands, no faux Disneyana. What we saw here was real, and small-town, and for the most part not polished and set up for visitors. I hope, even if the area gets a much-needed financial shot in the arm from increased tourism, that it manages to keep its rural simplicity. We skipped seeing Sam Cooke's house, W.C. Handy's house, and the Riverside Hotel, where Bessie Smith died and Ike Turner wrote "Rocket 88," because we were in a hurry to push on. We had a lot we wanted to see, and we wanted to get to New Orleans by the end of the day--we had hotel reservations. As it happened, we'd skipped one W.C. Handy house already, back on Beale Street in Memphis.